What's a manifesto? And do you need one for your business? Did you know that Seth Godin writes a manifesto for every book he publishes? I found that out through Marcy Nelson-Garrison, creator of the Card Deck Master Class, the program I used to create my card deck, The Blog Post Inspiration Deck. 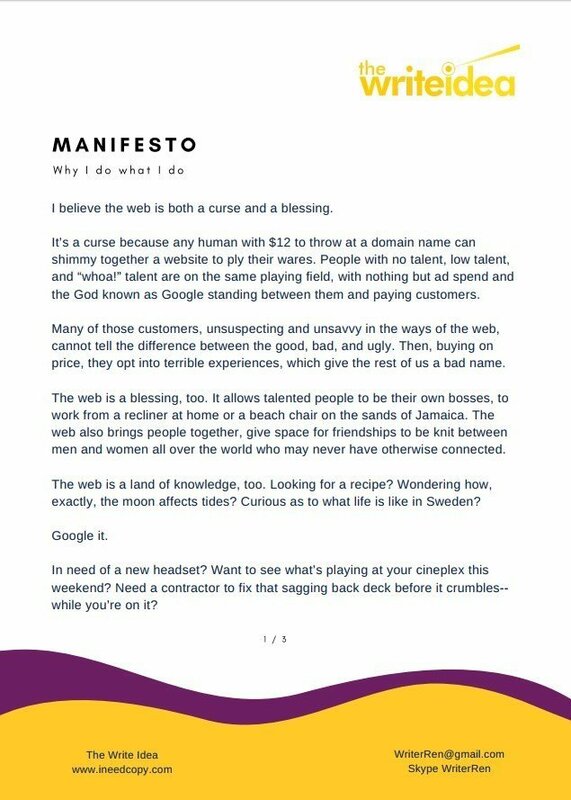 One of the assignments in the Card Deck Master Class when I took it was to create a manifesto for our card decks. Honestly, I wasn't hip to the idea -- until Marcy told us that Seth writes one for every book he publishes. If figured that if Seth was doing it, I ought to do it, too. But first, I need to learn a little more. I needed to figure out -- what is a manifesto? According to Merriam-Webster, a manifesto is a written statement publicly declaring the intentions, motives, or views of its issuer. "To this citation he made answer by a Manifesto" and "They were so farre surprised with his Manifesto, that they never would suffer it to be published." The word is still used and understood the same way today, almost 400 years later, even headlining as the name of a 2015 film by Julian Rosefeldt. During my research, I learned that manifestos are replacing mission statements. I can see why; whereas a mission statement is traditionally a short blurb about what you hope to achieve, a manifesto is about WHY and HOW you, uniquely, achieve it. That point is key: the best manifestos differentiate. They capture your WHY -- why you exist, what gets you out of bed every morning. Great manifestos state your values, clearly and boldly, for all the world and your prospects to see. I admit I'm particularly attracted to the graphic-style manifestos. 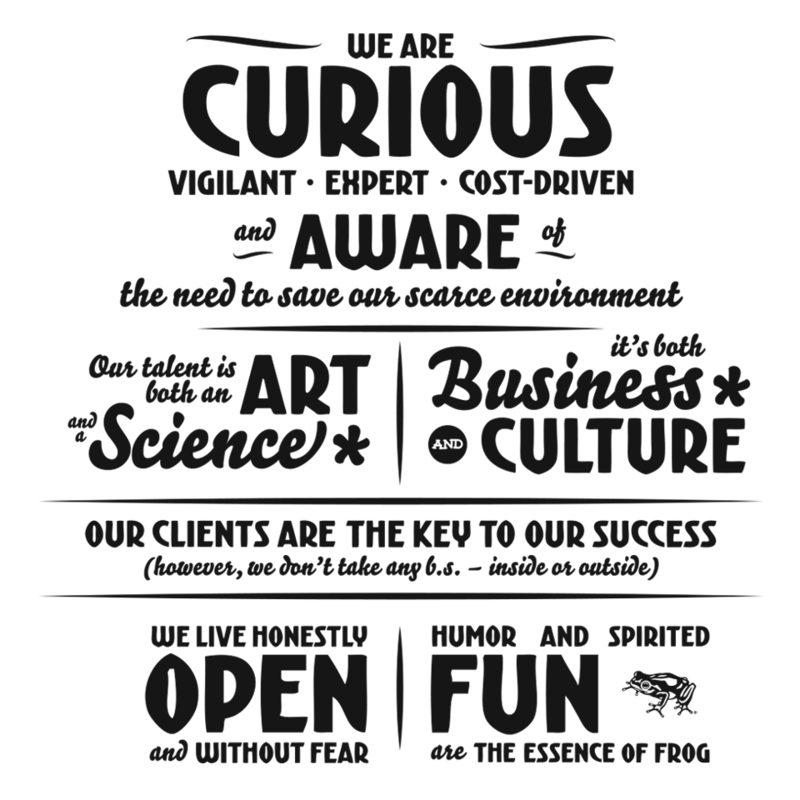 Such as this manifesto, by Frog Design. 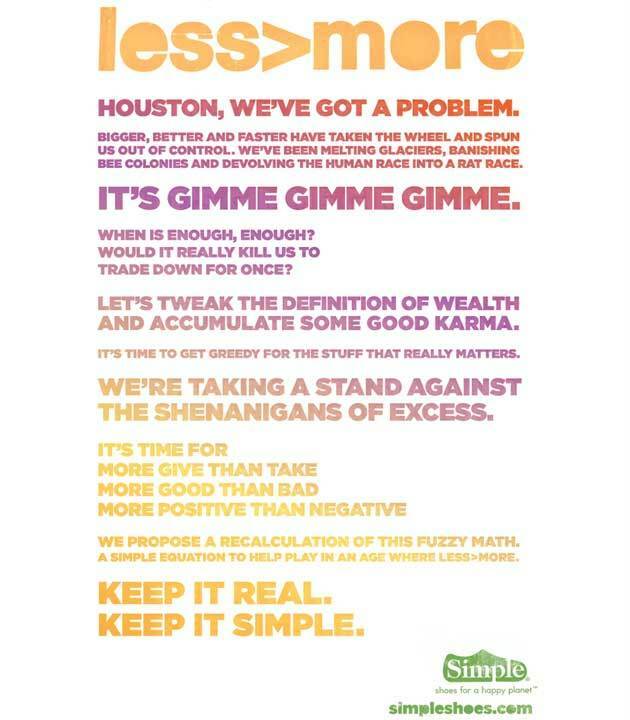 And this manifesto, by Simple Shoes. And I can't talk about manifestos without talking about Michael Schechter's Passive-Aggressive Manifesto, a manifesto against manifestos. In the form of a manifesto. I'm in the process of creating a visual manifesto for my business now. It'll be short, sweet, pleasing to look at, and easy to read. 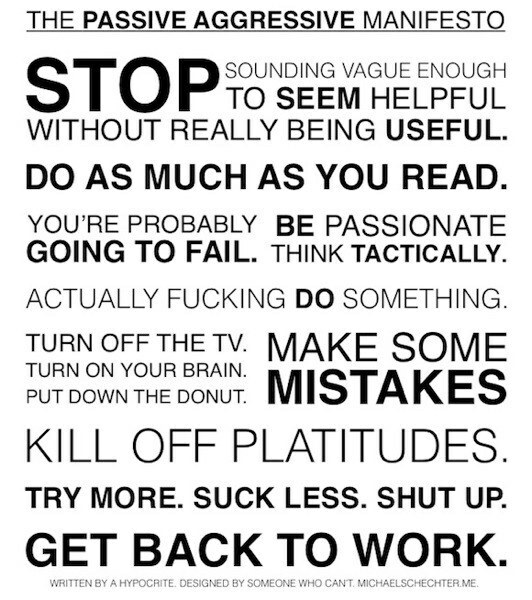 In the meantime, here's the text version of my manifesto in PDF format. Although its longish (ahem), I do think it's easy to read. 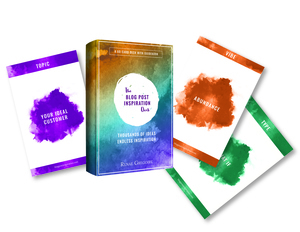 If, after reading it, you feel inspired or moved, or ready to hire me to help you write your own manifesto (! ), please let me know. Want to give a go yourself? Here are the steps I recommend you follow. Thinking about the work you do -- the transformation you bring to your clients or customers -- write down as many "I believe" statements as you can. They don't need to be in any sort of order at this point, nor do they have to be useful or good. Just get it all out of your head and onto paper or screen. If you have a team, ask team members to write down their "I believe" statements as well, letting them know there are NO wrong answers. Consider it a brainstorming exercise. Step 2: Analyze; find the pieces of your puzzle. Did anything pop out at you while doing the exercise? Maybe you noticed a theme, or a process, or key words that kept coming up for you again and again. Highlight whatever seems relevant, and be willing to let the rest fall away. When I reviewed my brainstorming list, I noticed an order revealing itself through the chaos. For instance, I noticed that many of my "I believe" statements revolved around my frustration as an online shopper: broken forms, terrible images, lack of information, lack of clarity, lack of contact details. I realized that many of my clients' customers likely face these same frustrations, making my experience with those frustrations a valuable 'extra' I bring to my work. I don't just write; I consider the experience of the buyer as well. I also picked up on the fact that I follow a specific, unique process when writing content. And that my ultimate goal -- my reason for being in business -- is to make the web a better place for all of us, one web page, one piece of content at a time. I highlighted these realizations, all of which made it into my manifesto. Step 3: Put the puzzle pieces together. After you've decided which "I believe" statements matter, put them into an order that makes sense. Start with your highest values ... your biggest WHYs. And then work your way down to the smaller details. You don't need to write paragraphs as I did. Your manifesto can take the form of a bulleted list, or an infographic, or a collage--whatever creative idea strikes your fancy. When your manifesto is complete, send it out into the world! Share it on social media. Send it to your customer list. Send it to your nurture list. Blog it. Vlog it. Share it all around. And then watch as you begin to attract more of your ideal customers, and less of those who aren't. We felt we had a void when producing wording for brochures and letters. Being engineers we used to write our brochures too technically and it took very long time to come up with the right words. After meeting Renae, things are different. She wrote our brochures and presentation letters to effectively attract prospective customers. She can convey technical contents in an easy-to-read and persuasive way. Having Renae do our writing was the most cost-effective decision regarding the preparation of our brochures and letters. I strongly recommend Renae to anyone looking to produce marketing communication pieces.